So now that we convinced you to come visit West Virginia due to its beautiful mother nature, there are a few other things to do while you are here that don’t involve spending time in the woods or outdoors. During the months of April through November, tourists can visit this allegedly haunted prison. 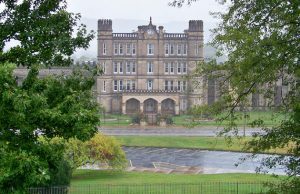 The prison itself was active for over 100 years from 1876 to 1995. During this time period, there were numerous fires, attempted escapes, prison riots, and over 100 executions from the death penalty. Visitors can be locked in a five foot by seven-foot prison cell and experience what life was like in prison. Paranormal lovers can spend the night there hunting ghosts and observe other alleged paranormal activity. Another unconventional, yet indoors, tourist attraction is the lunatic asylum. The building was constructed between the years of 1858 and 1881 and is known for having the largest hand-cut stone in the Nothern Hemisphere! The only other building to beat it out is the Kremlin across the globe in Russia. The architect Richard Andrews purposely designed the building too so each room would get a proper amount of “therapeutic” sunlight and fresh air as possible. There are several different types of tours available from learning about the stunning architecture, history, Civil War raids, treatment of the mentally ill and for the paranormal lovers, another placed that is allegedly haunted. Did you know that this building is actually taller than the one in Washington D.C? This building is made from limestone that was shipped from Indiana in over 700 train cars. The marble is from Vermont and Italy. The building offers tours daily if you are into the more conventional tourist destination. Check out their website. Whether you come to visit West Virginia for their indoor facilities or outdoor facilities you can be assured that you will have a good time.